Earth’s extra heat, you see, has spent the last 10 years sinking into the vast depths of the equatorial Pacific and Indian Oceans. That’s the conclusion of a new study, conducted by scientists at NASA’s Jet Propulsion Laboratory and published today in the journal Science. The study, which examines two decades of observational data, offers the most definitive evidence to date that Earth’s largest ocean has been massively redistributing heat since 2003. Specifically, cooling in the top 100 meter layer of the Pacific Ocean has been compensated by warming in the 100 to 300 meter layer of both the Pacific and Indian Oceans, which together cover over 40% of our planet’s surface. 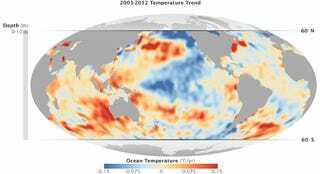 The global average ocean surface temperature has been rising since 2003 by +0.001ºC per year, according to Intergovernmental Panel on Climate Change. That temperature rise is notably slower than century-timescale warming of +0.006ºC per year since 1880. For the last few years, climate scientists have been trying to understand whether the hiatus was the result of a redistribution of heat within the ocean, or less overall heat uptake at the ocean’s surface. Over the last few years, a likely scenario has begun to emerge. Modeling studies show that the cooling of the surface of the Pacific is probably being balanced by more rapid warming in deeper parts of the Atlantic or the Pacific. What’s more, a recent paper in Nature Climate Change used observational data and models to demonstrate increased heat transport from the Pacific to the Indian Ocean over the last decade. Clearly, the pathways by which Earth’s oceans process heat seem to be changing. Observational estimates provide a more accurate means of assessing oceanic temperature changes and show clear decadal signals that are robust across different analyses and clearly significant relative to observational errors. Our findings support the idea that the Indo-Pacific interaction in the upper-level water (0-300 m depth) regulated global surface temperature over the past two decades and can fully account for the recently observed hiatus. Furthermore, as previously shown for interannual fluctuations, the decade long hiatus that began in 2003 is the result of a redistribution of heat within the ocean, rather than a change in the net warming rate. The scientific debate over global warming ended a long time ago. Misconceptions about the “hiatus,” however, have continued to add fuel to the woefully unscientific political debate that still rages in the halls of Congress. Hopefully, with this particular riddle now solved, again, we can all move on to the real task of reducing our fossil fuel emissions and preparing for a hotter future. You can read the full Science paper here. Top image: Trends in water temperatures in various depth layers of the ocean as measured between 2003 and 2012. Areas in red depict warming trends in degrees Celsius per year, while blues depict cooling trends. Via NASA Earth Observatory.